Walking early morning after a night of heavy rain, I was suddenly woken up by a cold shower of water. 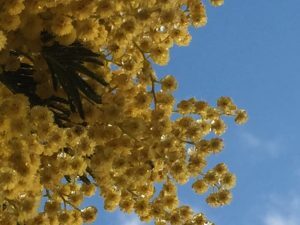 I looked up and to my delight I saw the beauty of the Mimosa above me, the droplets of water from its flowers falling on me. It was delightful and such a vision of beauty. It was really a reminder to look up every now and then. We spend so much time and energy looking straight in front of us, that often we miss the beauty or opportunity that presents itself purely because we only look in one direction. 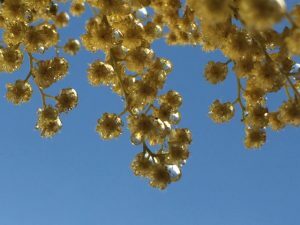 So just by raising our eyes and our vision we can create the possibility of seeing something new, potential maybe where we would have missed it before or simply beauty when things looked so mundane.